If you follow technology trends you have probably heard how “cloud computing” is going to take over the world. In this Podcast Doug Pullman, a member of the Parker, Smith & Feek marketing team, describes the planning and process this top 100 broker went through to prepare for their launch into the world of Facebook, Twitter, Linkedin, and blogging. Late last week we finished our latest Wellness challenge. Employees were challenged to complete 6 out of 14 activities such as, losing 5% body weight; lowering our BMI to 25 or lower; participating in one of the local community walking/running events; having our annual physical or dental exam. Yesterday (Thursday 7/22/2010) Congress passed, and the President has signed, The Unemployment Compensation Extension Act of 2010 (H.R.4213). The Act does not include an extension of the COBRA subsidy. …let’s take the rest of the summer off to read the Dodd-Frank Act! Mid July saw BP’s runaway oil well in the Gulf finally capped, but with clear warnings that the mounting drill pipe pressure poses new challenges, the Dodd-Frank Act (2,500 pages of financial reform) that was recently passed in the senate also poses some new challenges – reading it first, and then implementing it! The legislation requires regulators to write hundreds of new rules and conduct numerous studies which could itself launch a new job creation program and help lower unemployment, at least in DC. The 2Q10 earnings season arrived with some banks reporting higher earnings mostly due to revenues from higher credit card fees and revised downward estimates on problem mortgage loans. Major Banks are estimating that this new legislation will reduce its future earnings by 11%. One bank, Bank of America, has even started using a five letter acronym “GUEST” for G ’genuine welcome’, U ‘undivided attention’, E ‘empowered’, S solutions and T for ‘thank you’. Is this the new regulatory climate which apparently requires treating customers differently as it seeks to pass thru new fees to offset the loss in revenue? Individually we can justify nearly any gadget use and thanks to new technology the world has become a gadget superhighway that has no barriers. Parker, Smith & Feek is once again pleased to be a supporting sponsor of the Bellevue Art Museum’s artsfair. Our support means that admission to the Museum will be free Friday through Sunday, July 23rd, 24th and 25th during the fair. The 64th annual artsfair will be held at the Bellevue Arts Museum and at Bellevue Square. 325 exhibitors will offer unique, handmade arts & crafts that are seldom seen anywhere else. Media include drawing/pastels, fiber, furniture, glass, jewelry, metal work, mixed media, painting, photography, printmaking, sculpture, wearable and wood. After several months of rain, we are finally seeing a prolonged period of warm summer weather. I always find it funny that some of us in the Pacific Northwest will lament about the rain and cold weather for months, but if the temperature raises to above 80 for more than a couple of days, there will be people complaining about the heat as well. We seem to forget that we need a good mix of both sun and rain to create all of the lavish green surroundings that we all cherish. This reminds me a little of purchasing insurance, as we can lose sight of the long-term picture. During my career I have never seen the focus on price so heightened as it is during today’s tough economic times. And while I understand the need to focus on price, we continue to ensure that our account teams also keep focused on other variables such as claims service, contract language and risk management support that combine to make a robust insurance program. Our mission is to “guide our clients to make informed risk management decisions and develop innovative insurance, surety and employee benefits solutions uniquely suited to their needs”. This includes looking at all variables that allows us to advise clients on both the short-term and long-term aspects of your insurance program. Enjoy the weather, and let’s hope that it lasts just a little bit longer. Six months into the New Year we find the insurance marketplace and the economy just as challenging as we predicted. It seems many of our clients are still shedding jobs and are not seeing any indication of substantial change this year or next. Parker, Smith & Feek’s launch into the world of social media has highlighted more clearly the delineation of the generations within our firm. Not surprisingly those of us nearing the end of our careers are skeptical of any benefit. You may have noticed that we have just updated our website’s home page to accommodate some new enhancements. 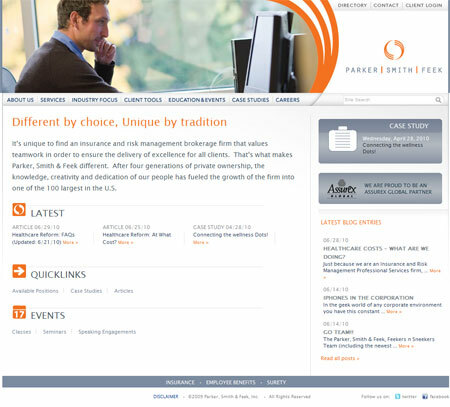 The new look is designed to give you easy access to the latest articles, case studies and other events here at Parker, Smith & Feek.